Nigeria's president has said the army has defeated Boko Haram in its stronghold of the Sambisa forest. The deadly terror outfit has killed 15,000 people and displaced two million in a seven-year insurgency. The Nigerian army has pushed the Islamist militant group Boko Haram out of its last stronghold in the northeastern Sambisa forest, President Muhammadu Buhari said on Saturday. The Sambisa Forest was where Boko Haram was believed to be holding some of the more than 200 schoolgirls kidnapped in April 2014 from a school in the town of Chibok. The mass abduction brought the Islamic extremists world attention and sparked an international social media campaign #BringBackOurGirls. "Further efforts should be intensified to locate and free our remaining Chibok girls still in captivity. May God be with them," Buhari said. 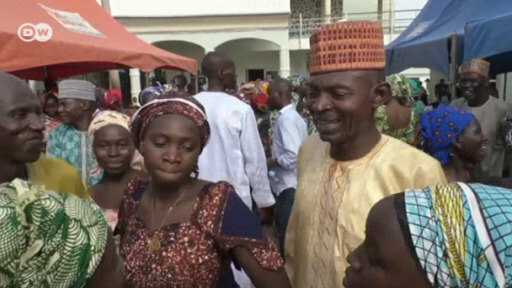 In May, one Chibok girl escaped on her own but some 197 remain missing. In October, 21 girls were freed after talks between the government and Boko Haram were brokered by the Swiss government and the International Red Cross. The freed girls have indicated that several others had died in captivity from causes including malaria and snake bites. An offensive led by the Nigerian army in recent weeks has dealt a "final crushing of Boko Haram terrorists in their last enclave in Sambisa Forest" in northeast Borno state, Buhari said in a statement. "The terrorists are on the run, and no longer have a place to hide" after security forces captured Camp Zero, Buhari added. The military said civilians should remain vigilant as Boko Haram militants scatter into surrounding areas. Boko Haram's seven-year insurgency to create an Islamic state governed by Sharia law has left at least 15,000 people dead and displaced nearly two million civilians in Africa's most populous country. The group still carries out suicide bombings in Nigeria, Niger and Cameroon. The extremist group once controlled an area the size of Belgium, but a Nigerian army offensive supported by troops from neighboring countries over the past year has put the extremist group on its heels. There was no word on the fate of Abubakar Shekau, who leads the Boko Haram faction in the Sambisa forest. There have ben reports that the insurgents have been regrouping in Taraba and Bauchi states, south of their northeastern stronghold in Borno state, and taking advantage of a decades-old conflict in central Nigeria between mainly Muslim nomadic cattle herders and sedentary Christian farmers. Five years ago, Boko Haram stormed a school in northeastern Nigeria and abducted more that 200 girls. About half of them were later freed, and received scholarships to study at a renowned university, but not all of their parents are happy about it.